The headline sounds a little like a medieval legendary story - and a fierce battle the match turned out to be, fought out, in close and fast and furious for four quarters. The Dragons were the quicker of the two protagonists, the Knights bigger and stronger in the tussles. With a large segment of the squad having only arrived in Australia in the previous 24 hours, the Knights started a little slowly. The first quarter saw China pull ahead early. Big Josip Habljak in ruck gave the Knights first use of the ball repeatedly. Ivan Ivos was a strong target up forward for the Knights, with Tomislav Cvetko assisting through the centre. However, the Dragons were able get to the loose ball more often. However, the experience Chinese star Chen Shaoliang had gained training with Port Adelaide﻿ put him a level above. The rest of the match was a much more even affair, with the Croatians increasing their intensity right up to the last moments. A goal to Ivos on the three-quarter time siren saw the margin back to only 8 points. The final quarter saw both sides attack fiercely, with Miro Jurmanović goaling for Croatia late to put them within 1 point. 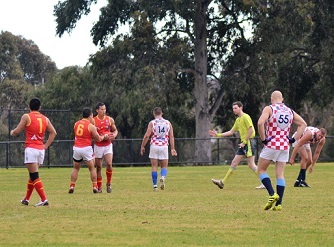 However, the Chinese held on in the tense final minutes to take the win. I think the final scores 7.3 (45) China to Croatia 6.8 (44) shows the Knights' inaccuracy in front of goal and that tells much of the story. Possibly Croatia's lack of experience playing 18-a-side footy on full sized ovals played a part as a number of their set shots on goal seemed to be from a bit too far out. Although a couple of Dragons goals were long bombs over the heads of defending Knights and luckily bounced through for majors. S. Chen, S. Kia Chen, B. Chueng, J Chuang, C.Yu. Goal Kickers: S. Chen 2, C. Yu, J Zheng, H.Lin, Z.Chen, D.Wie 1. China climbed one place to 18th Rank whilst Croatia slipped to 15th on WFN World Rankings.